The 100th Bomb Group Foundation is honored to bring the activities of the 13th Combat Wing and its very distinguished Groups to the attention of the general public through this web page. We have developed the logo you see below, along with links to our sister groups, the 95th and 390th. We applaud those two great organizations that we shared the deadly sky with, five miles above Hitler’s "Fortress Europe". 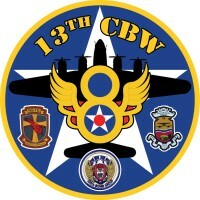 We ask them to join with us to educate and promote the history of the the 13th Combat Wing through our respective web sites so future generations never forget the sacrifices all three Groups made. The Pilot of this plane was Capt. James Geary, who came to the 100th Bomb Group after completing a tour with the 390th BG. He was shot down on his second mission with the Group while flying as lead pilot on the March 24, 1944 mission to Berlin. This is a GREAT piece of historical work. Pistol Packin’ Mama: The Missions of a B-17 is the story of a plane and its crew and the missions they flew in the grim early days of daylight bombing during WWII. As members of the 390th Bomb Group, they led their squadron, their group, and sometimes the entire 8th Air Force into action. The life of a bomber crewman is shown here as never before . . . the strain and the cold, the fear, the sense of death and loss, the bond of camaraderie. Through the use of dramatic oral histories, stunning combat film footage and rare personal photos, this is how it was battling fighters and flak 25,000 feet above Hitler’s Third Reich. Produced in 1991, this film has been long unavailable, but is now being re-released in DVD. More information on this film can be found at www.americanherofilm.com.